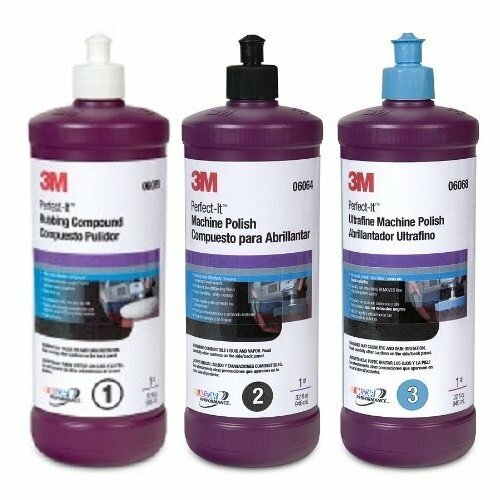 This kit includes (1) 3M 6068 Perfect-It Ultrafine Machine Polish - 1 Quart, (1) 3M 6064 Perfect-It Machine Polish - 1 Quart, and (1) 3M 6085 Perfect-It Rubbing Compound - 1 Quart. 3m 06068 High Performance Ultrafine Machine Polish is a unique formula that eliminates swirl marks and produces a high gloss finish, even on the most difficult dark colored vehicles. Good handling, easy cleanup. 3M 06085 Perfect-It Rubbing Compound is a fast cutting rubbing compound designed remove sand scratches and leaves a fine finish on automotive paints. 3M 6068 Perfect-It Machine Polish is a high performance machine polish that quickly and effectively removes compound swirl marks and produces an outstanding finish. Good handling, easy cleanup. WARNING: This product can expose you to chemicals which is [are] known to the State of California to cause cancer and birth defects or other reproductive harm. For more information go to www.P65Warnings.ca.gov. 3M 06085 is a fast cutting rubbing compound designed remove sand scratches and leaves a fine finish on automotive paints. 3M 06064 is a high Performance Machine Polish. Quickly and effectively removes compound swirl marks and produces an outstanding finish. Good handling, easy cleanup. 3M 06068 produces a swirl free finish even on black vehicles. Quickly and effectively removes fine machine polish swirls. Outstanding finish. The unique formula eliminates swirl marks and produces a high gloss finish, even on the most difficult dark colored vehicles.